Any implementation of the Common Core State Standards must promote equity, access, and inclusion, and close achievement gaps. Cowritten by WestEd’s Karen Kearney, this new resource shows educators how the central tenets of the Common Core—rigor, meaningful curricula and assessment, and higher-order thinking—can become educational realities for every student. 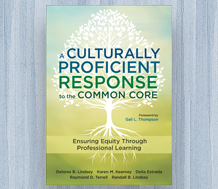 Visit the Culturally Proficient Response to the Common Core: Ensuring Equity Through Professional Learning resource page to learn more and purchase a copy.